We spent two weeks on our Community Helpers theme. One of our crafts involved mixing paint to make a fire. I showed my students red and yellow paint, putting some of each on the paper. I placed a piece of plastic wrap on top of the paint and asked them to mix the two colors to make a fire to put out. We discussed how we started out with yellow and red and then I asked them what other color they saw when they were finished. The next day we painted hands blue after gluing on a hose. Students used their blue hands to make water come out of the hose to put out the fire. Activity was inspired by this pin. Thanks to another teacher I received these small red cups. I placed foam numbered flames with hot glue onto each cup after discovering that sticky tack definitely does not work. Students sprayed the cups to put out the fires. As the sensory bin was used it got more difficult to place the cups in stacks due to the fact that the cups slide around in the water. These community helper puzzles were a great find at the Green Valley Book Fair. I love that they are self checking; they will not go together unless they are in the correct puzzle. I found a great set of community helper vehicles and people to clip together. Creating this uses quite a few clothes pins, so I suggest grabbing a set at the dollar store. In addition to community helper activities we also worked on letter C activities. My students are very interested in everything dot marker, so I put together many different dot marker activities for my students. The one pictured can be found here. Our pretend play has been an Auto Shop. 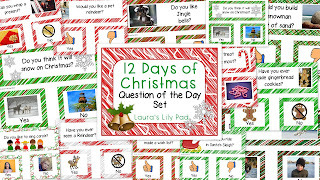 Printables for this are from Pocket of Preschool. I discovered a few things this year that were not an issue last year. I tried a different method of raising up the car this year. The cubes worked okay, but one student tried to kneel on one of them. So, we ended up sliding the two crates directly under the car, which actually allowed two spots for the students to lay under the car at a time. I also discovered that my students liked twisting the pipe cleaner wires around the crate instead of into the car. I did not complain since it was still great fine motor work for them. I also discovered that my students liked dumping things into the car and sometimes needed help getting things out to put them away. Next we will take the car and turn it into a tractor for our pumpkin patch. This year we have had an entire week dedicated just to penguins. I was excited to bring out my life size penguin creations that I have saved from when I taught sixth grade many years ago. (See, there is sometimes a good reason to save things.) I have fond memories of teaching middle school and love seeing my current students measure themselves against an emperor penguin. Are you taller than an emperor penguin? If you notice there is a small photo of the penguin nearby. This is just one of many photos of real penguins hidden around the room for our penguin search dramatic play. I found the penguin photos here. I created a check sheet for the students to carry around the room on a clip board, along with binoculars and gloves, to search for many of the kinds of penguins. Along the way nearly every student became an expert at putting on winter gloves. I had some penguin counters to use with this spinner game, so I added it to my math and fine motor area. You can find it here. I like finding games that I can use fun counters with since the three dimensional counters attract the students even more than any clip art can. This is how this puzzle was left at the end of the day, but I did have several students work through getting the puzzle into order from eleven to twenty to make the penguin picture. It did help to have some numbers drawn along the side of the board. I laminated and put magnets on the back of this puzzle. I am finding that my students do better with these types of puzzles on the magnet board because they do not slide around as much when they are trying to line them up next to each other to complete the puzzle. This puzzle comes from here. My director bought us some insta-snow to try out, so I added it to my sensory bin, along with a tube of penguins. I found photos to match the penguins in the tube and hung them above the bin. Several students matched them up and asked me the names of the different penguins while playing. We also had some sensory play at the writing center with baking soda and white hair conditioner. I used some penguin and fish alphabet letters I found here to have students choose which letters to write, although many tried out letters in their names instead. The students enjoyed this so much that I promised to move the baking soda and conditioner over to the large sensory bin the next week so they could play with it in other ways, rather than just flattening it and drawing letters. At circle time we used the pocket chart to go through the emperor penguin’s life cycle. We also read some books and tried balancing bean bags and balls on our feet to pretend to be a daddy penguin. The cards at the bottom were photos of opposites in Antarctica. I was able to go through these cards with a few of my students during centers time to introduce the idea of opposites. One of my fine motor activities included using our poke pin. I found this penguin, which several of my students started to work on but did not finish. I think that preschoolers probably need smaller poke pin projects if we want them to complete them. I just encourage my students to work on them and come back again another day add some more holes. I also had some half sheets of letter review available for students who wanted a smaller poke pin project. These are just a few of our penguin centers. We also did our sponge penguins again. You can see an example of that from last year. We also ended the week with black and white day and a penguin snack. Do you have a penguin week in your preschool? What is your favorite activity?